The surveyor's house was a sturdy and comfortable haven from the cold of a fierce Dakota winter for the Ingalls family in 1879. Photo by Colin Faulkingham. 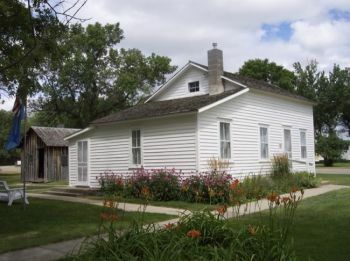 When Charles and Caroline Ingalls brought their family to Dakota Territory in 1879, they found a winter home in a railroad surveyor's house on the shore of Silver Lake, near DeSmet. All the surveyor asked was that Charles guard the company tools. The Ingalls lived cozily in the house (which has since been restored by the Laura Ingalls Wilder Memorial Society and is open to visitors to DeSmet.) It must have been a memorable winter, because Laura — who went on to become famous for her Little House writings — wrote about it 37 years later (1916) in a Thanksgiving column for The Missouri Ruralist. We first published her account in our November/December 1988 issue, and are pleased to have the opportunity to share it with you again. As Thanksgiving Day draws near again, I am reminded of an occurrence of my childhood. To tell the truth, it is a yearly habit of mine to think of it about this time and to smile at it once more. We were living on the frontier in South Dakota then. There's no more frontier within the boundaries of the United States, more's the pity, but then we were ahead of the railroad in a new unsettled country. Our nearest and only neighbor was 12 miles away and the store was 40 miles distant. Father had laid in a supply of provisions for the winter and among them were salt meats, but for fresh meat we depended on father's gun and the antelope which fed in herds across the prairie. So we were quite excited, one day near Thanksgiving, when father hurried into the house for his gun and then away again to try for a shot at a belated flock of wild geese hurrying south. We would have roast goose for Thanksgiving dinner! "Roast goose and dressing seasoned with sage," said sister Mary. "No, not sage! I don't like sage and we won't have it in the dressing," I exclaimed. Then we quarreled, sister Mary and I, she insisting that there should be sage in the dressing and I declaring there should not be sage in the dressing, until father returned — without the goose! I remember saying in a meek voice to sister Mary, "I wish I had let you have the sage," and to this day when I think of it I feel again just as I felt then and realize how thankful I would have been for roast goose and dressing with sage seasoning — with or without any seasoning — I could even have gotten along without the dressing. Just plain goose roasted would have been plenty good enough. This little happening has helped me to be properly thankful even tho at times the seasoning of my blessings has not been just such as I would have chosen. "I suppose I should be thankful for what we have, but I can't feel very thankful when I have to pay $2.60 for a little flour and the price still going up," writes a friend, and in the same letter she says, "We are in our usual health." The family is so used to good health that it is not even taken into consideration as a cause of thanksgiving. We are so inclined to take for granted the blessings we possess and to look for something peculiar, some special good luck for which to be thankful. I read a Thanksgiving story the other day in which a woman sent her little boy out to walk around the block and look for something for which to be thankful. One would think that the fact of his being able to walk around the block and that he had a mother to send him would have been sufficient cause for thankfulness. We are nearly all afflicted with mental farsightedness and so easily overlook the thing which is obvious and near. There are our hands and feet — who ever thinks of giving thanks for them, until indeed they, or the use of them, are lost. We usually accept them as a matter of course, without a thought, but a year of being crippled has taught me the value of my feet and two perfectly good feet are now among my dearest possessions. Why! There is greater occasion for thankfulness just in the unimpaired possession of one of the five senses than there would be if some one left us a fortune. Indeed, how could the value of one be reckoned? When we have all five in good working condition we surely need not make a search for anything else in order to feel that we should give thanks to Whom thanks are due. I once remarked upon how happy and cheerful a new acquaintance seemed always to be and the young man to whom I spoke replied, "Oh he's just glad that he is alive." Upon inquiry, I learned that several years before this man had been seriously ill, that there had been no hope of his living, but to everyone's surprise he had made a complete recovery and since then he had always been remarkably happy and cheerful. So if for nothing else, let's "just be glad that we are alive" and be doubly thankful if, like the Scotch poet, we have a good appetite and the means to gratify it. And some want meat that lack it. And sae the Lord be thanked. That's a beautiful photograph of the Surveyors' House! in the introduction there is an error. Charles and Caroline brought four daughters to South Dakota, not three. Great addition to our Thanksgiving! Thanks for all you find and share. Blessings to all of you and yours for bringing us Laura's inspirations today!